By July 1922 the first two policewomen in Leeds (appointed 1918 and 1920) had both resigned, within months of each other. The official history of Leeds Police doesn't mention a reason. 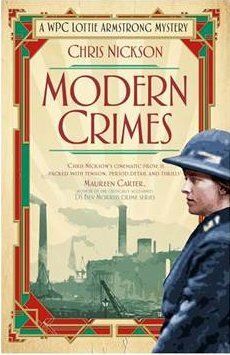 Those pioneering women were the inspiration for Lottie Armstrong, the heroine of Chris Nickson’s new novel, Modern Crimes. Lottie ends up working on the case with Detective Sergeant McMillan, and it quickly turns to murder. Finding the truth takes her from the poverty of the back streets and the hangover for the Great War to the front parlours of the rich, where the language of money speaks loudly. And part of the trail leads her to the Royal Hotel, one of the homes of the gay and lesbian community in Leeds, a place where secrets are kept and some revealed. While Modern Crimes are committed in the novel, the impulses behind them – greed, fear, hate – show that the basic human impulses remain the same. As Lottie shows herself to be a superb detective, the initiative a woman shows to find answers doesn’t sit well with those in charge. But how far do they believe is too far for a policewoman? Bringing alive Leeds in the 1920s, the mix of vibrancy, glamour, fashion and wealth, next to the squalor and deprivation that hadn’t changed since Victorian times, Modern Crimes immerses the reader in the past – and into Lottie’s battle to solve the mystery.